• 6 week, 4 session/week (24 Total Training Sessions) plan with an emphasis on Strength and Work Capacity. • This training plan is one of the 182+ Plans included with an Athlete’s Subscription. Leopard deploys our most recent tactical programming theory for Fire/Rescue Athletes. 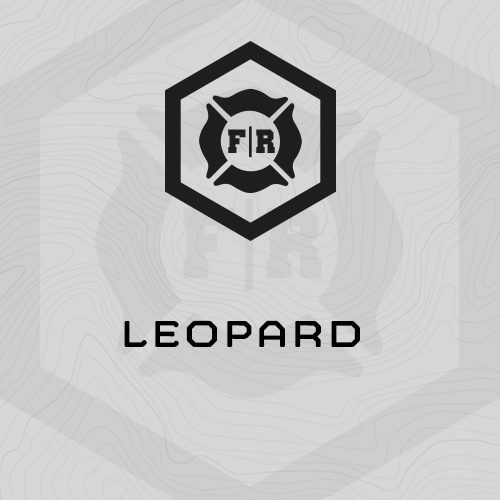 Leopard is a 6 week, 4 session/week (24 Total Training Sessions) plan with an emphasis on Strength and Work Capacity. Chassis Integrity, TAC SEPA and Stamina are also trained, but the emphasis for Leopard is strength and work capacity. Strength – Jaguar’s strength work is focused on 3 classic strength exercises: Push Press, Walking Lunge and Front Squat. The plan deploys our proven “Big 24” strength training methodology. Work Capacity – 300m Shuttle Repeats, Hard Step Up Intervals, 5-20 minute gym-based multi modal efforts. TAC SEPA – Emphasis on explosive power and level change agility drills. Chassis Integrity – 1x/week – Hybrid circuit which combine lower back, total, rotation and anti-rotation core exercises from standing or kneeling positions. *** Note: Many of the weight training exercises in the plan can be completed with either a barbell and plates, or dumbbells/kettlebells. For example, if the session calls for power cleans, and your station doesn’t have a barbell/plates, you can substitute dumbbells and complete hang power cleans instead. We recommend Fire/Rescue Athletes train at their fire or duty stations. For a 24 hours shift, we specifically recommend you train early in the morning the day your shift begins, and again early in the morning the day your shift ends. Why? So others can see you training, and see that it can be done. As well, training during these times will help limit your work-specific training to the work place, and help address the burden of constant fitness over the course of your career. (2) Repeat (1) wearing Turnout Gear and SCBA pack (no mask). (3) 10 Minute Grind ….